Graffiti Murals - SPARCinLA We are SPARC: Art | Community | Education | Social Justice SPARC | Social & Public Art Resource Center | Creating Sites of Public Memory Since 1976 | Founded by Judy Baca, Donna Deitch & Christina Schlesinger | SPARC is a community cultural center that creates public art as a vehicle to promote civic dialogue, foster cross-cultural understanding, and address critical social issues. We accomplish our mission by producing, preserving and presenting community-based public art. SPARC is a facilitator Ð finding ways to tell richly textured stories that help community participants and artists achieve a measure of change and transformation. The following article was taken from an early December, 1996 issue of the Daily Bulletin, a newspaper serving the Pomona community. Public art or public nuisance? Police say murals are against the law. Pomona—As a young boy, Robert Castillo spray-painted his graffiti illegally. He was a tagger then. Castillo, 23, said he wants to show off his graffiti legally now. He and his friends have contacted property owners to ask their permission to spray-paint graffiti art. But that wasn’t enough for Pomona police. The department’s code enforcement unit said graffiti on the Kitron Radio wall, near Park Avenue and Second Street violated city laws and must be erased. Downtown property owner Gene Hoelzle plans to comply with the demand to remove the graffiti, which includes a large mural, by Dec. 14. But he thinks it’s unfair that he can’t allow graffiti on his property if he wants it. It’s not the first time the Police Department has banned graffiti-styled art in the city. In January, at the request of Councilwoman Paula Lantz, painted over graffiti on a Freeman Shoe Store wall. At the heart of the matter is whether Castillo’s and others’ graffiti constitute art. Its creators say it’s art, but police say it’s vandalism that other people don’t want to see. And the city doesn’t have regulations on what kind of public art, including murals, should be allowed or banned. Police Lt. Rick Mackey said the graffiti’s presence violates the city’s zoning ordinance, which calls for “unsightly, hazardous or inappropriate conditions” in the city to be removed. Graffiti falls in the same category as broken windows, overgrown weeds and trash that must be removed once targeted by the city. An unidentified person also complained about graffiti Mackey said. Mackey said the graffiti wall has contained vulgar language. He also objected to the phrases “Graffiti Terrorism?” and “We were hit hard last night.” He said the f-word was also painted on the wall. “It glorifies the gang culture, weapons and the destruction of property,” Mackey said. 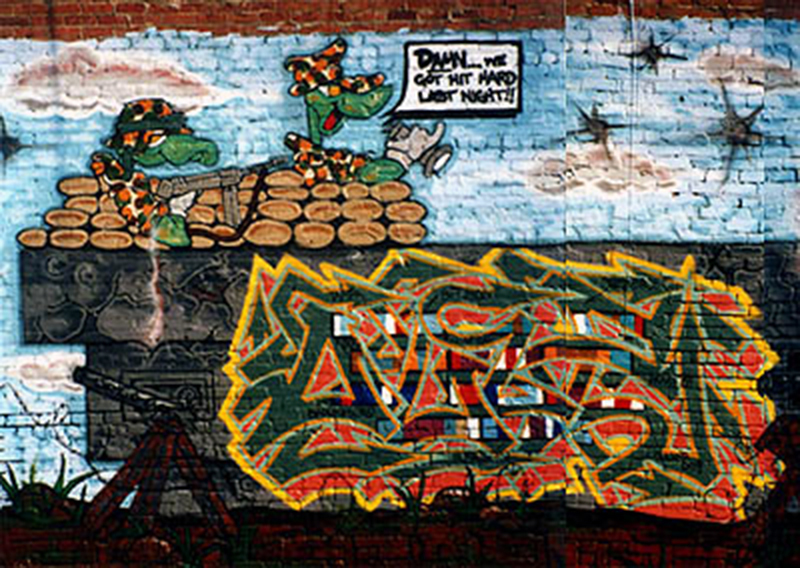 A graffiti mural painted on the wall depicts a “bomb” scene in which artists spray-painted their names in large, abstract letters. The bold artwork stands out among the old, colorless surroundings. Any vulgar language observed by the police several weeks ago had been removed last week. Another wall also contains names painted in diferent colors. Robert Castillo painted his artist name, Sign, in bright hues of blue next to Trus, a name painted in emerald and teal green. Mayor Eddie Cortez, who’s met with the artists before, said he values their artwork. But it shouldn’t contain vulgar language or drawings that offend people, he said. Cortez said he’d even be willing to connect Castillo and his friends with property owners who want murals on their business walls. Fred Castañeda, 23, a graphic designer who’s also spray-painted on the wall, said their critics dislike their artwork because they don’t understand it or think it’s gang-related. Castañeda he and his friends aren’t gang members. Castañeda and his friends have painted murals at La Cabaña Restaurant on Holt Avenue and at the Pomona Beautification Day in 1993 at Fairplex. Hoelzle said the police told him he could obtain a permit to have a mural on his propety from the city’s Planning Department. But City Planner Dennis Mackay said the city’s laws don’t outline what kind of art should be allowed in the city. Although murals have previously existed in the city, a permit has never been required for them, he said. The definition of a mural has also been added to the city’’ sign ordinance, which will be reviewed by the City Council early next year. Art regulations will also be added to the downtown specific plan. “There needs to be a public discussion about the community standards regarding public art,” said Tessier, who plans to sponsor mural projects in the downtown area. In February of 1999, a huge collaborative mural was painted on the north-facing wall of a thrift store off of Lankershim in North Hollywood. Permission was obtained by me and a young kid by the name of Miguel Angel who had initially found the wall. The wall itself had been plagued with gang graffiti for years. Ugly green stencil vines and leaves attempted to hide the scrawlings. We spoke to the manager and we told him our idea, he was all for it and said he would tell the owner. He finally got back to us and stated that they were willing to let us do it as long as we didn’t charge anything. In turn, we had artistic freedom to paint whatever we desired. So just in time for the B-Boy Summit, we gathered together some of the most talented artists in the scene and rocked the entire wall in about two days. The wall was about 100 feet long and about 15 feet tall. Everyone in the community really loved it. People stopped by and took pictures of the mural and congratulated us on the work. About two months later 5 of us returned to paint the opposite side of the building which faced south. Ironically, it was adjacent to a lingerie shop across the street from a strip joint. We completed that wall in a couple of days as well. About a month later I returned to see if we could paint the back wall as well. The manager said that city officials had dropped by to inquire about the mural. They claimed “official” permission was never granted by the city and it would need to be removed. The manager got upset and told them the wall had stopped the tagging on his building and the surrounding neighborhood and he was not about to destroy it. Within weeks they returned with an alleged petition from the community in favor of destroying the mural. The store was threatened with a fine if they did not oblige. So with regret they agreed. The mural was whitewashed and destroyed. I was never notified directly by the city nor its officials, although they had been given my business card by the manager. We chalked it up as another injustice of many which we have experienced over the years. At least we had pictures and memories which will last a lifetime. As for the wall, gang graffiti continues to bombard the wall daily and the city comes out and sprays over it every once and a while. Life goes on. A new mural is in process to replace the current Iraq War piece covering the walls that surround the SPARC parking lot. The new work is being produced by a group of invited graffiti artists who do wonderful work in any medium, but whose “can control” can be considered at the level of mastery. As part of our changing outdoor exhibition, the new mural is addressing the growing anti-immigrant sentiment in our country and in the world. Look in on this uncensored, free space that will showcase the graffiti artists’ new work.